Jordan Rapana will return to the Raiders side for their round two clash with the Storm, just six weeks after having shoulder surgery. Rapana needed reconstructive surgery after returning home from New Zealand's tour of the UK, having dislocated his shoulder twice on tour. Canberra had considered bringing in a replacement player, and had been given the green light by the NRL to get salary cap relief. He was expected to be sidelined until about round 12, but his recovery has gone better than expected. Rapana will play on the right wing alongside centre Joey Leilua, which means Bailey Simonsson who made his debut in the season-opener against the Titans drops to an extended bench. Simonsson, who scored a try in the 21-0 victory over Gold Coast on Sunday and made 124 metres from 15 runs, misses out in the only change from that team. Michael Oldfield (groin) remains sidelined but is expected to be fit by rounds 4-6. The Storm have named an unchanged starting side, with Pat Kaufusi taking Tom Eisenhuth's (larynx) spot in the 17. 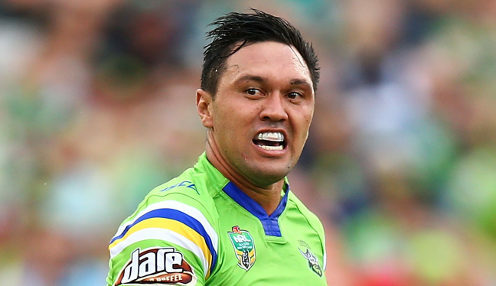 Fullback Charnze Nicoll-Klokstad, who only joined the club five weeks before the start of the season, has kept his spot for the Raiders. The 23-year-old said he hoped to put in an improved display against last year's beaten grand finalists. "There were a few errors throughout the game and the mentality after those errors [shows] the growth of our side - we were able to get onto the next job and just move forward - and that helps," said Nicoll-Klokstad. "It was just down to communication; even the one I dropped was down to communication. We'll look to work on that and see how we go this weekend." Canberra are 59/50 to win their next game against Melbourne Storm, who are 18/25. The Raiders are 91/100 with a four-point start.